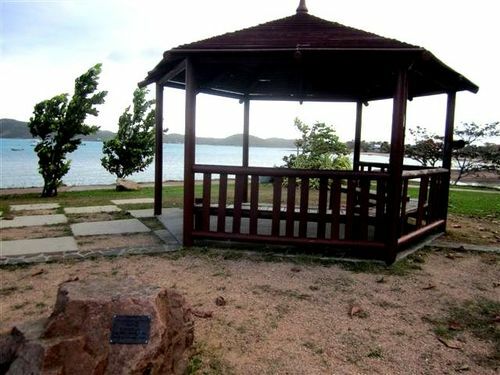 Rotunda donated by Mrs Mogi in recognition of Divers involved in the Torres Strait Pearling Industry. In the 1860s the pearling industry began in the Torres Strait and marked the entry of the Torres Strait into the global economy. Pearl and Trochus shells were gathered in large numbers to make buttons. Pearl shells obtained from the Torres Strait found a ready market in the clothing industry in the United States and England especially for buttons and buckles. The Torres Strait supplied over half the world demand for pearl shell in the 1890s. The development of plastic buttons and buckles in the 1950s devastated the pearling industry in the Torres Strait by the 1960s. With the decline of the pearling industry in the Torres Strait, many Islanders were forced to move to the mainland in search of work.